As a former dual military couple, April Jarrett and her husband understand why the fast food industry is growing in popularity. “It can be time-consuming trying to prepare a meal as soon as you get home from work,” stated April, owner of Little Friends Family Child Care Home in Virginia. By participating in the National Early Care and Education Learning Collaborative (ECELC), April not only learned about healthy food choices, but received valuable tips on how to improve her food preparation time. April learned helpful ways to prepare healthy meals ahead of time as there was limited time during the day to prepare meals while caring for the children. April also learned how to include more cooking activities for her children and that cooking involves the use of children’s motor skills when stirring ingredients together and pouring them out. 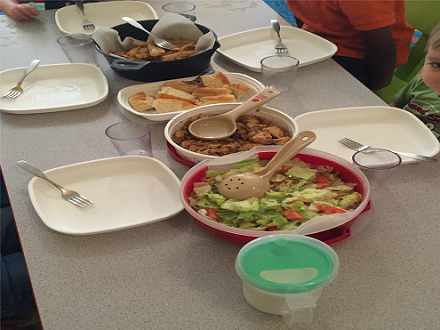 At CentroNia, a multicultural learning community in Washington D.C., they believe children and families must have proper nutrition to be best positioned to learn. Through tasty and nourishing meals they seek to inspire children to maintain healthy lives. Grow It, Try It, Like It! Nutrition Education Kit Featuring MyPlate is a garden-themed nutrition education kit which features fun activities through an imaginary garden at Tasty Acres Farm. Each set of lessons contains: hands-on activities, planting activities, nutrition education and recipes to try at home.